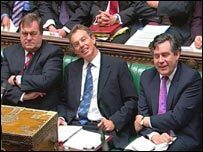 Probably the last thing Tony Blair needs right now is another row over Europe. He is already fighting a rearguard action against his chancellor over plans for a referendum on the single currency. Now, apparently out of a clear blue sky, another storm has burst over demands for a separate referendum on the planned European constitution. And this one appears to be gathering enough power to turn into another genuine political tornado. Most worryingly for the prime minister is that the convergence of these two twisters could easily tear the roof off Downing Street and send him scuttling for the bunker in the basement. First off, Mr Blair and Gordon Brown are desperately - and far from convincingly - trying to tell us that they are united over the single currency. And they have started meeting individual cabinet ministers to prove it. These meetings are supposed to be about listening to ministers' views of the awe-inspiringly detailed Treasury assessments of the famous five tests. But they are also clearly designed to try and present a united front from Mr Blair and Mr Brown who, despite all their statements, continue to use markedly different language when talking about the euro. And few believe this consultation process will change much. The chancellor will still have ruled out an immediate referendum and the prime minister will still be refusing to close the door on one this side of the next election. Indeed, the consultations and the final special cabinet meeting should ensure the prime minister gets his way on that. But that will mean the rows will continue. But now the government has started to take serious sniper fire from the Tories and its own backbenches over the Euro constitution. 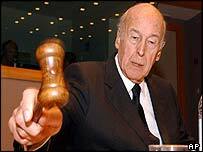 The visit to Downing Street by the architect of the proposal, former French president Valery Giscard d'Estaing, has added to the suspicion amongst those already deeply suspicious about Europe, that plans are afoot for a federal EU. Comments by Wales Secretary Peter Hain that the constitution is simply a "tidying up" exercise which does not warrant a vote by the people of Britain has enflamed the row. The Tories, meanwhile, appear surprisingly united on both these issues - they want referendums on both as soon as possible in the belief the Eurosceptic public would oppose them and, in doing so, fatally wound the government. And they are clearly enjoying the fight and their new found cause. This has landed the government with a major job of persuasion to do if voters are not to run away with the idea that they are being denied a say on the very future of the country. The problem with EU documents like the constitution, however, is that they are designed precisely to allow everyone to interpret them the way they wish. For European federalists, it may indeed be presented as a blueprint for an eventual United States of Europe. For the more nation-state minded, it can be presented as a clarification and simplification of the role of the EU. And there's probably enough evidence to allow any shading of view along that line. Tony Blair clearly has yet another major campaign of persuasion ahead of him to win around a sceptical public. But, as his recent behaviour over Iraq has shown, he is in no frame of mind to buckle. There is a sense of deja vu about Tony Blair's new euro push. Q&A: What now in euro saga?